Are you looking for a delicious pork recipe with a difference? If you are, you’ve found it! 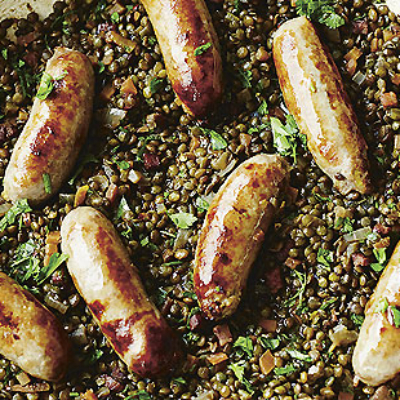 Here’s my italian sausages with braised lentils for you to enjoy. 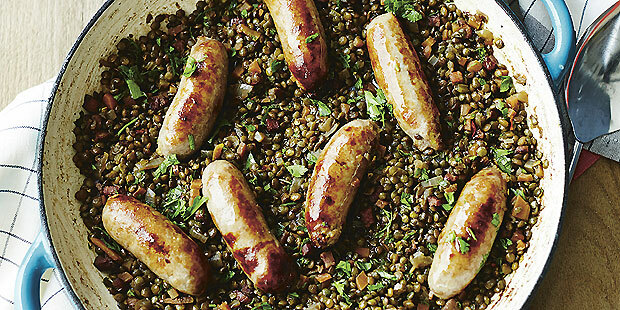 Feast your eyes on the finest italian sausages with braised lentils! It’s straightforward and fun to make this great dish. Simply follow the instructions below and get the perfect result. Heat the oil in a lidded frying pan. When hot, fry the sausages for about 10 minutes until browned. Set them aside on a plate. Add the butter, onion, carrot, celery and chilli to the empty pan and fry on a medium to low heat for 10 minutes until starting to caramelise. Add the pancetta and fry for 5 minutes until crispy. Rinse the lentils under cold water, then add them to the pan. Stir well, then pour in the wine. Allow to simmer and reduce to 2 tablespoons. Pour in the stock, return the sausages to the pan, then cover and bring to a simmer. Cook gently for 40 minutes, adding more stock if needs be, until tender. Stir in the parsley and season with salt and pepper. 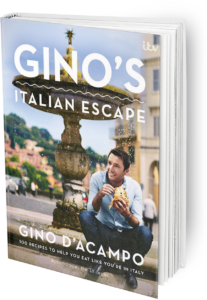 Once you’re done, simply sit back and enjoy your italian sausages with braised lentils and don’t forget to check out other great authentic Italian recipes including great antipasti recipes, Italian pasta recipes, Italian soup recipes, Italian beef dishes and authentic pizza recipes.